Most compact and light mobile system. 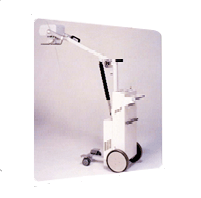 The small and compact size enables easy movement in the hospital. The PX-110CL has a compact head which makes the patient feel comfortable with the unit. The small and compact size enables minute movement between beds in the hospital. Stable and high performance inverter system and high quality of batteries carry out the best resolution. This unit is a pioneer system in mobile X-ray units class to apply wireless power method by batteries. Therefore, it works anywhere in the hospital for an emergency and I.C.U. This unit is a pioneer system in mobile X-ray units class to apply wireless power method by batteries. Therefore, it works anywhere iin the hospital for an emergency and I.C.U. Used / unused cassette can be stored in cassette box up to 10 pieces.